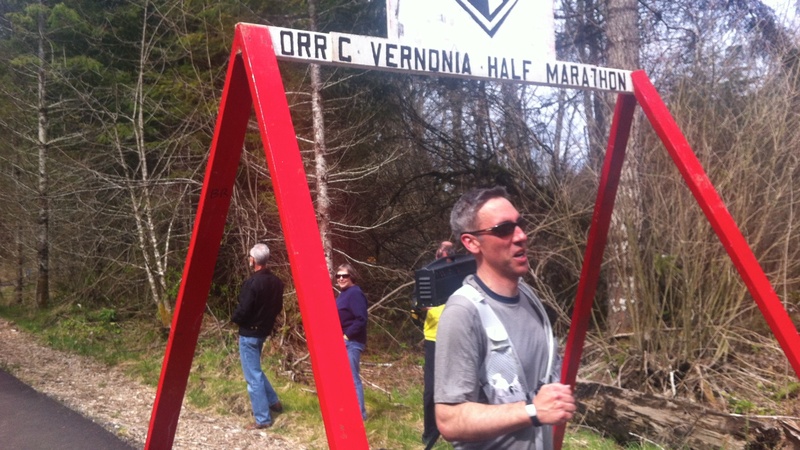 Last weekend I ran the Vernonia Marathon alongside my husband running his first half marathon. It was a whirlwind of a weekend, and it felt like my most meaningful race yet for a variety of reasons. First I will describe the beautiful course and share my thoughts on this small but well-organized race. For those who wish to read on, I am happy to share the ways in which this run was extra special for me. Track finish – so much fun! With fewer than 125 runners in the full marathon and 375 in the half, the Vernonia Marathon & Half Marathon is a small race by any standard. The small field accommodates starting runners in both events at the same time and location, which is a nice bonus for couples or friends running different distances. My husband ran the half-marathon and I was able to run the entire distance with him, then continue on to complete the full marathon. We rode the bus with another couple doing the same, and I am sure there were others. The race also offers a one-hour early start for slower participants only, which is a great option for walkers or run-walkers. The point-to-point course starts in Vernonia, Oregon, and follows the entire 21 miles of the asphalt rails-to-trails Banks-Vernonia State Park to Banks, Oregon, where marathon finishers enjoy a track oval finish at the Banks High School. All runners are bussed from Banks to the Vernonia start. Half-marathoners finish on the trail right alongside the marathon route, another bonus to those running the different distances together. Half-marathoners are then bussed back to the parking in Banks. I felt the race was very well-directed. The course was clearly marked and signage adequate. Traffic was well-controlled at the Highway 47 crossing just before the half marathon finish. There were plenty of volunteers to help direct runners and to direct traffic along the course. The water station were staffed by pleasant volunteers who seemed well-trained. (OK, not that handing out water is rocket science, but there is some logic that goes into it and it’s nice when they all get it right!) Later in this report I suggest a few minor fixes that would have made our day even better. Now I’ll describe the elevation profile and then the course details. While the course is fairly flat and fast and there is only one very, very short steep hill, it is not an entirely flat, über-fast course in the vein of California International Marathon or the Bizz Johnson Express Half. The course does start on the road with a zippy 150-foot drop in the first mile and a half. 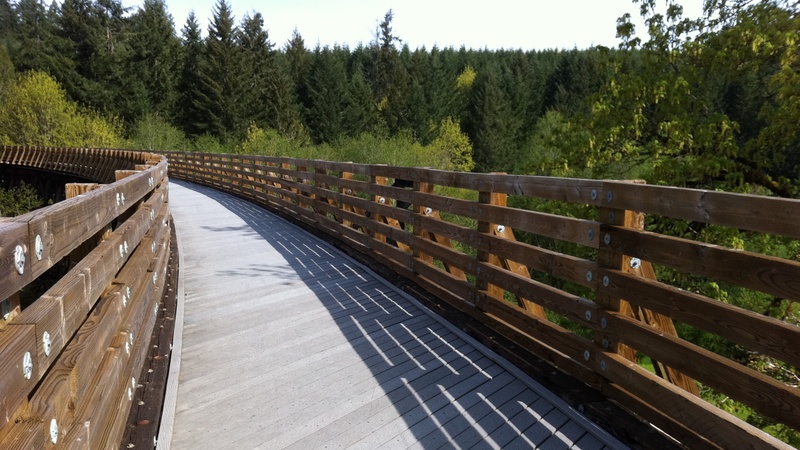 It is completely flat on the path around Vernonia Lake and for the first bit of the rails-to-trails path. Then there is a slight but steady climb from mile 6 through mile 15, with the exception of the very short steep dip down (and later back up) to cross Hwy 47 right before the half marathon finish. Those running the full marathon are rewarded with a gentle 700-foot drop between miles 15 and 21. The grade is kind to the quads and makes busting through “the wall” at mile 20 much easier than it might be otherwise. The remainder of the course is flat to very-slightly downhill, though it does run through open farmland that is susceptible wind. I did experience a noticeable headwind for the several of these flat miles, but the open landscape is beautiful and worth the minor increase in effort. With an average total precipitation of less than 50″, Vernonia is not even close to being a rainforest by definition, but it is certainly surrounded by beautiful, lush, green forest. This race does not have a great track record with weather, so I know we lucked out with cool starting temps and partly overcast skies ending just a tad on the warm side. As an Oregon native, I always remind people that you can’t get those glorious shades of green without the rain! 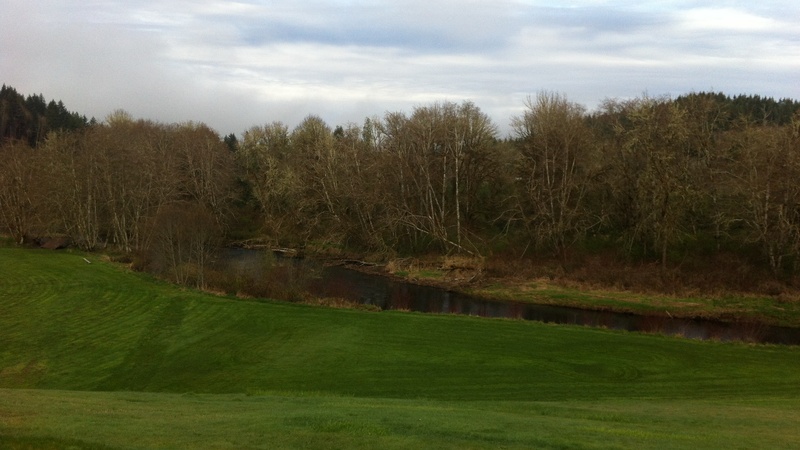 The race starts at the beautiful grounds of the Cedar Ridge Retreat & Conference Center in Vernonia. With bright green grass and Rock Creek running through the “backyard,” it was a lovely place to start the morning. The numerous indoor toilets were a huge bonus! At the start, we ran down the road for about a mile until we passed through the town of Vernonia, then onto the bike path from Anderson Park to Vernonia Lake (a.k.a. the mill pond). The old mill pond is prettier than I expected, surrounded by pink flowering trees (see photo at the top of this report). After doubling-back for a short distance to Anderson Park, we finally enter the official 21-mile state park trail. The forest is deep shades of lush green with sparkles of moisture. It is a mystical sight as the morning dew burns off. Only the sounds of vehicles on nearby Highway 47 break the spell. 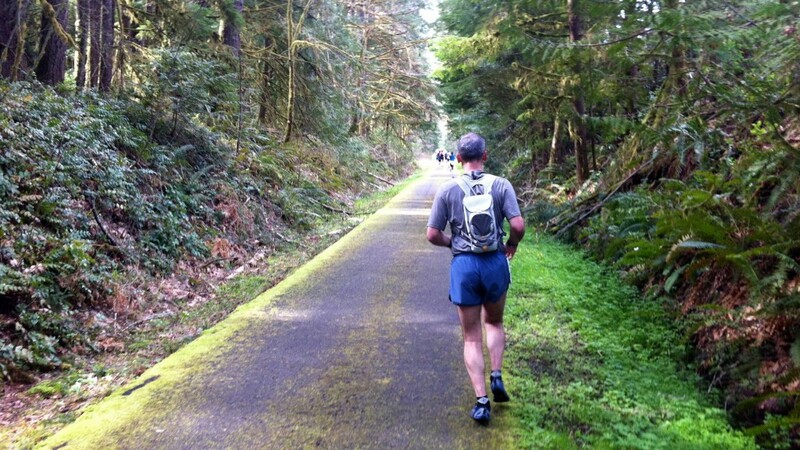 The full marathoners continue to enjoy deep, lush green forests through L.L. “Stub” Stewart State Park, for about 3.5 miles starting at mile 14.5. If you choose to step off the trail instead of going to the next port-a-potty, be careful! I experienced an unpleasant encounter with a stringing nettle here last year. While the trail boasts 13 bridges, the most impressive is the Buxton Railroad Trestle at about mile 19. It is some 80-feet high and outfitted with new decking and guardrails. By the time you reach mile 22, you are down the hill and into farmland. The wide views are a lovely backdrop to the last miles on the path ~ I’ve run this section several times before and the morning mist is really majestic. By early afternoon, though, a headwind had set in that made me wish for a Clydesdale with headphones to hide behind! The end of the rails-to-trails path was a welcome sight, knowing that less than a mile remains to the finish. The final mile is mostly lackluster running on the sidewalk through Banks. Volunteers cheer you on as they manage traffic at each intersection until you return to the high school parking. A long chute takes you through the parking lot to the track, where you get to be a track star on the oval before arriving at the finish. I greatly enjoyed both the chute and the track finish! The course was beautiful, the toilets plentiful, and the people friendly ~ there was little not to like. A few minor tweaks could help make it even better. I would have appreciated a count-down to the start, or at least a “gunshot” to announce the start. When the field did move, the runner in front of me was picking up a dropped item from the ground! My husband had trouble finding the half marathon results posted after his race. Apparently, they passed the results around on the bus ride back to Banks, but he didn’t get a chance to see them. So, this one is really, nit-picky, but it would be nice if we didn’t have to walk on wet grass from the retreat center to the start line. I recognize that most years the day is wet in any case, but I would have preferred to not start the run with wet feet. I highly recommend this race for its very scenic and reasonably fast course. It looks like either distance would be great for slower runners and walkers, as well. The race was well-organized and the price very affordable. The small field has a friendly feeling and makes for plenty of elbow room, but it does leave the course quite lonely at times. The weather in Oregon is, well, the weather in Oregon. I know that we lucked out this year, and an April race is more likely to experience precipitation than not. If I run it again, I will certainly keep an eye on the forecast and go prepared. Keep reading for my personal account of race day. This marathon held special meaning for me on many levels. Most importantly, the half marathon was my husband’s first race of any kind and I got to run it with him every step! It was also special for me to start a race in my Dad’s hometown and end it just 15 minutes from my parents’ current home. The primary purpose of our trip to Oregon last weekend was to celebrate my Grandfather’s 100th birthday. So I loved running by the old mill pond and thinking about my Grandpa, who worked at the mill before it closed in 1957. 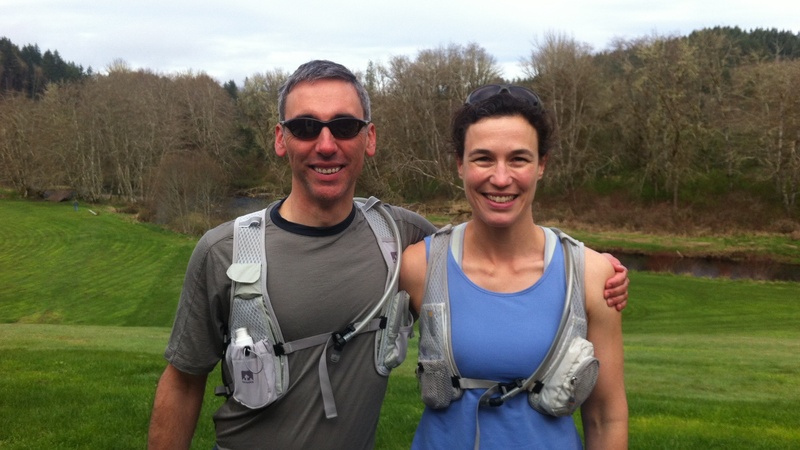 Hubby & me ~ all smiles at the start of the Vernonia Marathon! I first ran on the Banks-Vernonia Trail just a year or two ago, then last May I enjoyed a run of the first 9-miles out and then back from the Banks side. Since then, I’ve had thoughts of running the entire trail at some point. When we firmed up travel plans for Grandpa’s 100th birthday party on Saturday, I put out feelers to see who would want to do some or all of a 20-miler with me the day after the party. My sister-in-law let me know that they were running the marathon that day, and I immediately counted the weeks to see if I could be ready for 26.2. It was a stretch for me to prepare for an April 15 marathon, but the conspicuous lack of a nordic ski season in Tahoe did open up my schedule a little. I managed an 18-mile run at altitude and decided to call that good. After all, Europeans train only to 30 km, which is just 18.6 miles. The big birthday party was the day before the race, and I unfortunately managed to stay on my feet for the entire day until returning to my parents’ house after bib pickup late Saturday afternoon. Thank goodness for my Mom, who fixed a fabulous dinner while hubby and I put our feet up! Carbo-loading on a primal diet takes on a whole new meaning. Only a small quantity of carbs can have a large impact. I had a gluten-free dinner roll and a gluten-free cupcake at lunch. Mom’s delicious steak dinner included only a sweet potato and roast veggies for carbs, though I did top it off with about half of a Dove solid chocolate Easter bunny. On race morning I had a three-egg omelette and bacon for breakfast, followed by a double whole-milk latte. One nice thing about a late race start is that it allows for time to process a more substantial breakfast. This was my first marathon since switching from a substantially vegan diet to a primal/paleo diet in December. My calorie intake during the race was about half of what it has been for past marathons, and I never felt hungry or even close to “bonking” for lack of fuel. I took a caffeinated Hammer Gel at the start. Throughout the first three hours I took a total of 5 Clif Shot Roks (about 1/2 package) and a couple of macadamia nuts. I also took one additional (non-caffeinated) Hammer Gel. About Mile 1.5 ~ We got to run right by my cousin’s house in Vernonia, complete with leftover balloons from Grandpa’s party! So much fun to have her cheering us on the course. 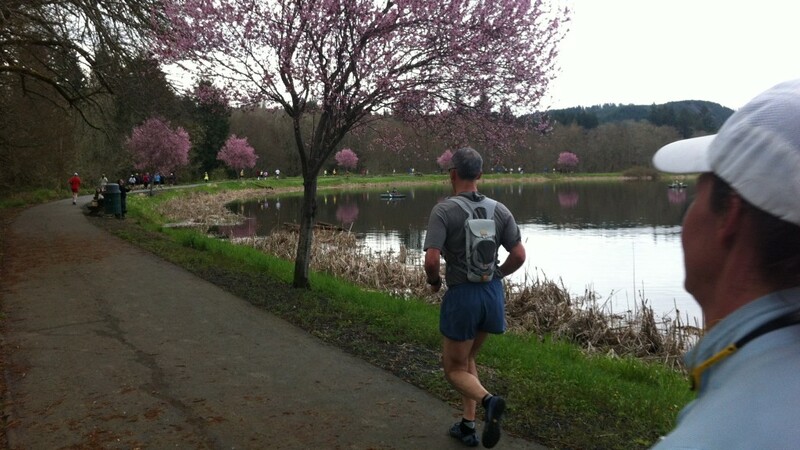 Mile 3.25 ~ Hubby stopped at a restroom next to the old mill pond to pee. I didn’t mind the opportunity to snap some photos! Shortly after mile 7 ~ Hubby’s toe was cramping and we slowed our pace by about a minute for a mile or two while he compensated for it. I was worried about him cramping so early in his race, but he really impressed with how he adjusted and worked through it. Mile 9 ~ So excited (but not completely surprised) to see that my awesome second cousin drove out from Portland to cheer us on. She is the Marathon Maniac who inspired me to run my first full marathon, so we really appreciated seeing her on the course! The Vernonia Half Marathon Finish is right on the path alongside the full marathon course. Mile 13.1 ~ Hubby finished his first half marathon in 2:04 with the most minimal of training! I was able to run ahead to capture this photo. After his finish, I walked the short steep climb where the path returns to the old railroad bed, then continued my run. Miles 14-18 ~ These were lonely and relaxing miles through the shady forest of Stub Stewart State Park. There were very few runners in view and I managed to eventually pass each one that was in my sights for the rest of the race. As I got closer to Banks, I did appreciate seeing more of the general public on the path (mostly cyclists headed in the opposite direction). With so few fellow runners around and only very sporadic spectators, it was nice to get a few cheers from the cyclists and to have someone to direct a smile at. About mile 21.5 ~ I started to cramp near the insertion point of my soleus (calf) muscle. I had never experience a leg cramp during a race (or any other run, for that matter). I wondered if I would even finish the race. I walked through the next aid station and then drew on my husband’s toe cramp experience to know that I could get through it. I tried to adjust my leg alignment, but that only helped a little. Next, I focused all of my energy and breath into stabilizing my core. I mentally drew on everything I had to do this, from my body work with Jen Fluharty at Full Circle Movement in Truckee to my ongoing ChiRunning practice. Within a mile the cramp passed, and I made a conscious decision to keep running strong and to finish with at least an even split. I focused almost all my thoughts and energy for the final 45 minutes into my breath. I used my Garmin foot pod data (an incredibly thoughtful birthday gift from my parents) to keep my cadence above 90 RPM. I considered taking another caffeinated Hammer Gel, but I didn’t really need it. I doubt that I could have processed it in any case, given the effort level that it was taking to maintain my pace and avoid the return of the leg cramp. Finally I arrived at the track and was already feeling pretty happy with my pending finish. I enjoyed the final 300 or so meters around the oval and finished in just under 4:08, for a perfectly even split. Not a PR, but a pretty damn great day to run with my hubby, enjoy the forest where my Dad grew up, celebrate my Grandpa’s 100th birthday, and finish relatively strong despite barebones training. I hung around to pick up my second-place age-group ribbon and for a chance at winning a raffle prize. I love raffle prizes! I didn’t win the raffle, so I returned to my parents’ place to shower and pack up for our flight home to Truckee that evening. Before we left, I gave my finisher’s medal to my Mom, to honor her mainly for being my Mom, but also for the great dinner and watching the kids all day! My hubby ran his first half at Vernonia too. How fun! Hope he had a great day – we sure did! Considering this race, I really appreciate the report. It would be my first Marathon after a sort of severe injury and surgery (18 months of recovery so far…) Just wondering the elevation profile looks worse than you describe, is the decline there REALLY gentle? THanks for an excellent report, your photos make me want to hop a plane today!!! Hello & thanks for the note! The profile image makes it look much steeper than it is. The course elevation change is really very, very gentle. There is only one short spot right before the half-marathon finish where it goes steeply down to the road and back up – maybe 1/4 mile each way – easily walked if need be. If you do decide to go to Oregon, you will be rewarded with a beautiful course, but be sure to be prepared for any weather! What a fantastic race report!! Sounds beautiful! Thanks for the note! Happy running to you in the coming year! Great race report. I’m running the VM this April. Thanks for commenting on afibrunner and thanks for taking the time to write this detailed race report. Thanks for reading and I hope your training goes great. Your personal narrative of running with a fib (http://afibrunner.wordpress.com) is really inspiring ~ helps us all to remember that we all have unique challenges and needs.